It is with a heavy heart that I am sharing the news that one of our young Peregrine falcons has died. I received a call on Monday about a bird that was found near a telephone pole just a few blocks south of downtown Kalamazoo. She flew into something – maybe the pole or a guide wire. I was hoping it wasn’t a falcon, or at least hoping it was not one of our Kalamazoo birds. But, unfortunately, it was Merze (Black 27 / blue Z). She was an adventurer and fledged early but had a safe landing and was put back into the nest box. She then became a good flyer, but as teenagers, these birds don’t have a lot of experience. Half of young falcons die within their first year. This intimate glimpse we get into the world of Peregrine falcons through the webcam and watching them live is such a privilege. The delight of seeing them grow and mature and soar is so uplifting, and the setbacks and losses are heartbreaking. 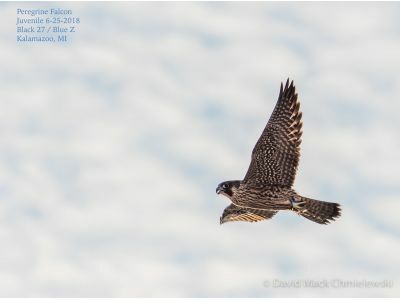 The other juvenile falcons seem to have started their next adventures. They have not been seen in the area for several days. This is the time of year that they start to travel, and we wish them success and long productive lives.